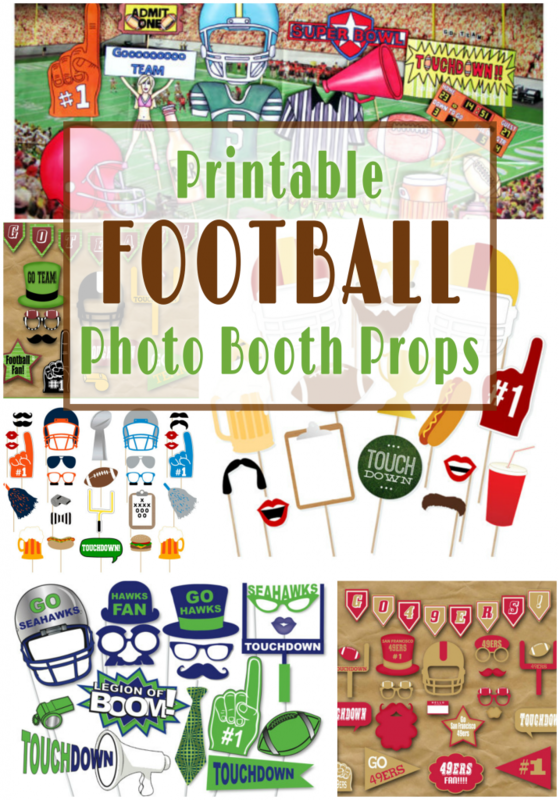 These Printable Football Photo Booth Props are perfect for adding some laughs and fun to your football watching parties. 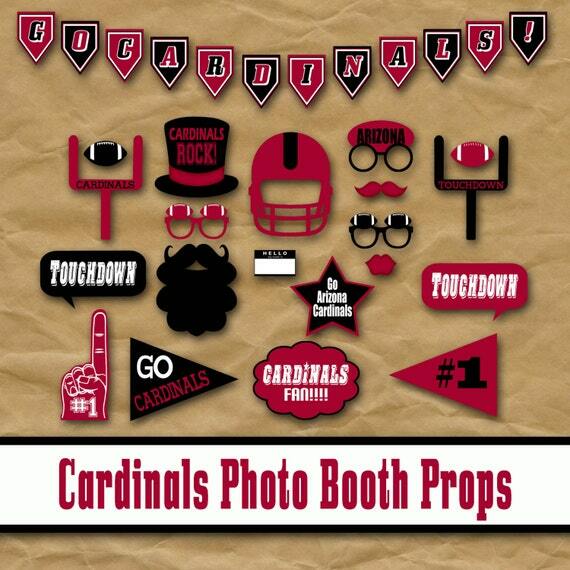 Everyone will have a blast striking a pose while cheering on their favorite team! 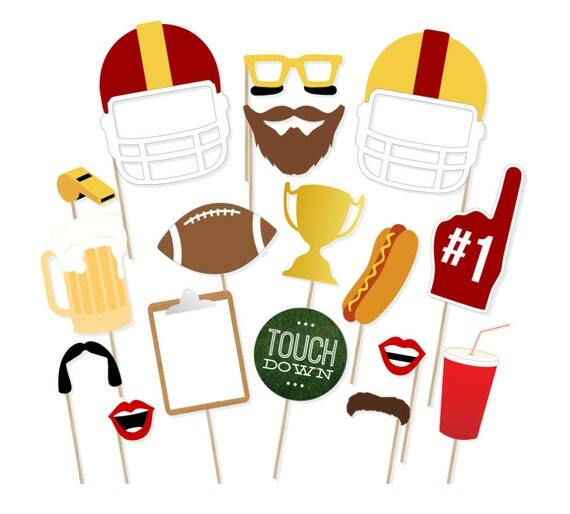 Who are you cheering for? 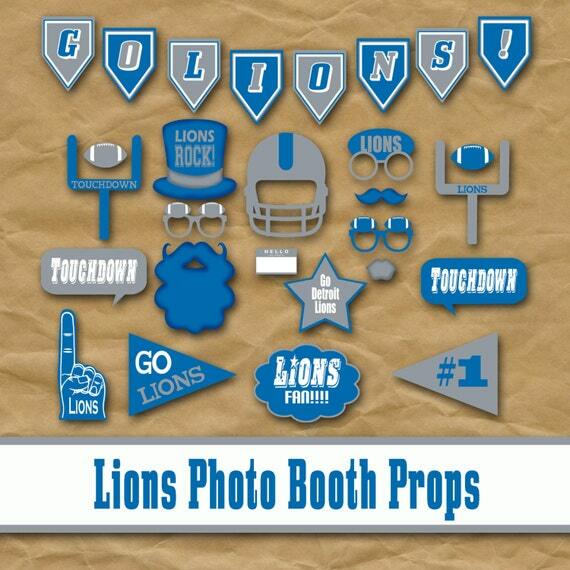 Below, you will find a collection of printable football photo booth props for NFL regular season games, high school or college football games, and as well as team props for previous Super Bowls. 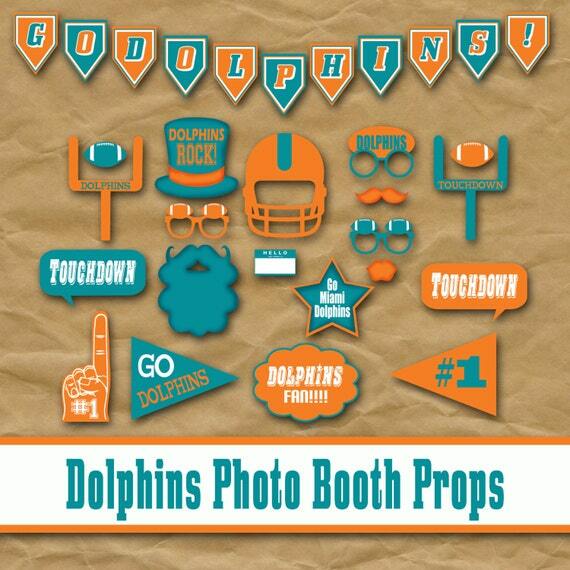 This article will be updated in January 2017 with photo booth props specifically designed for the 2017 Super Bowl. 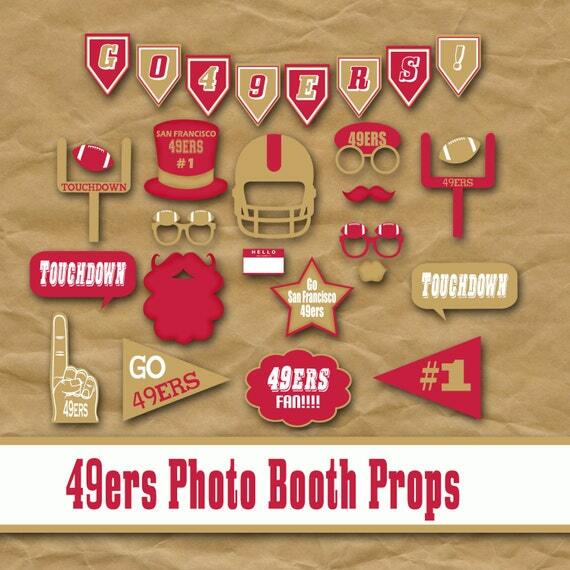 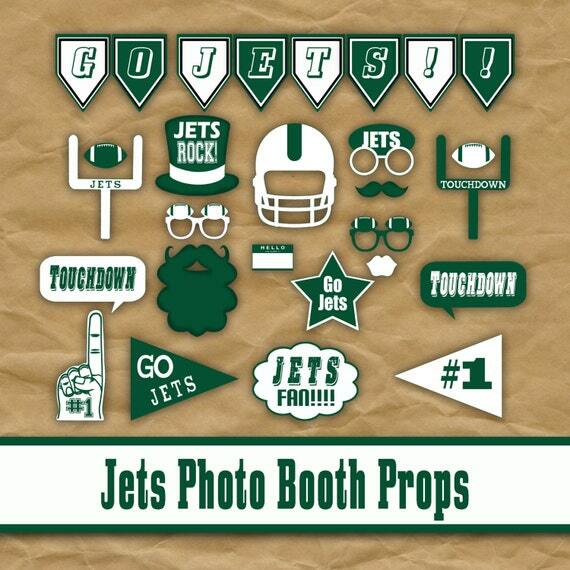 These football photo booth props are designed by graphic designers on Etsy. 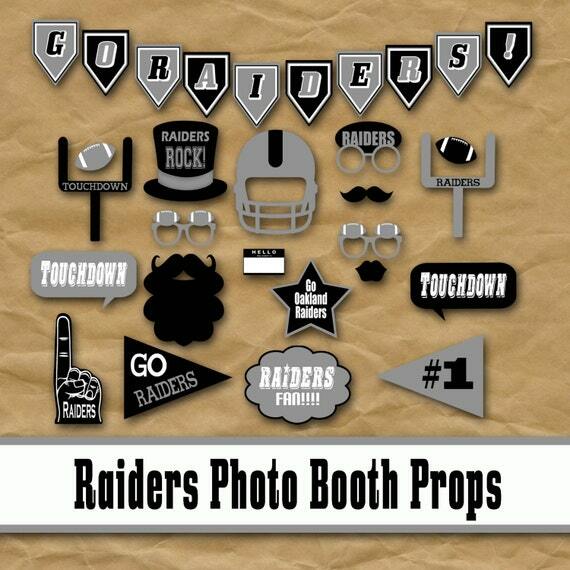 Pay a small fee for the design and print them yourself at home or at a photo center. 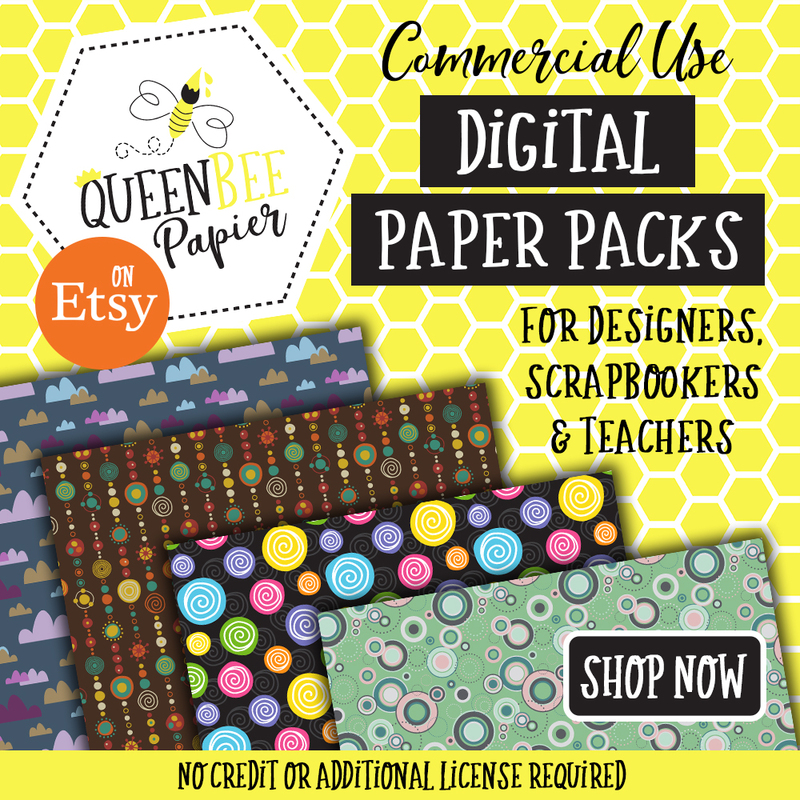 These are digital files that are sent to your email – there is no physical products shipped. 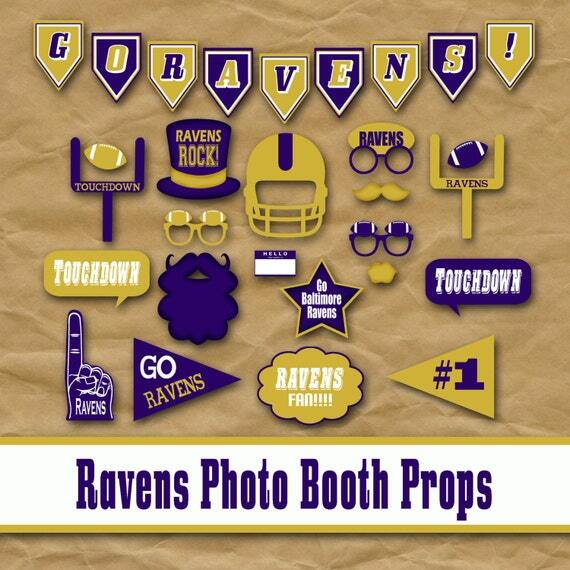 For best results, print the photo props on heavy white cardstock or photo paper. 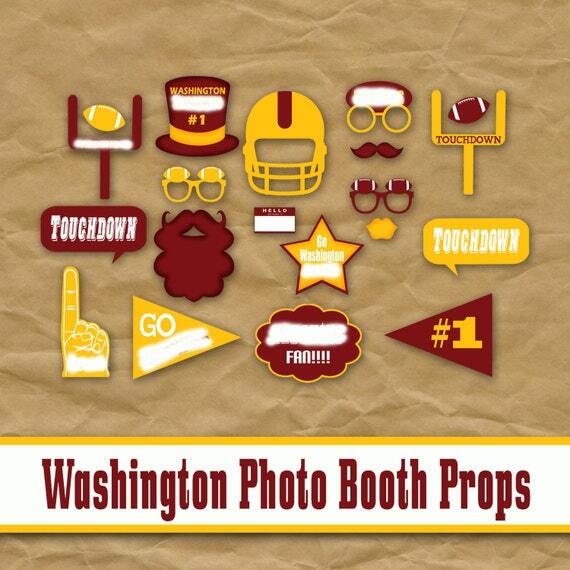 Cut them out and attach a wooden dowel to the back of each prop. 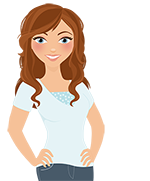 If you plan on re-using the props, laminating them will make them last longer, preventing them from wear and tear, spills and sticky fingers. 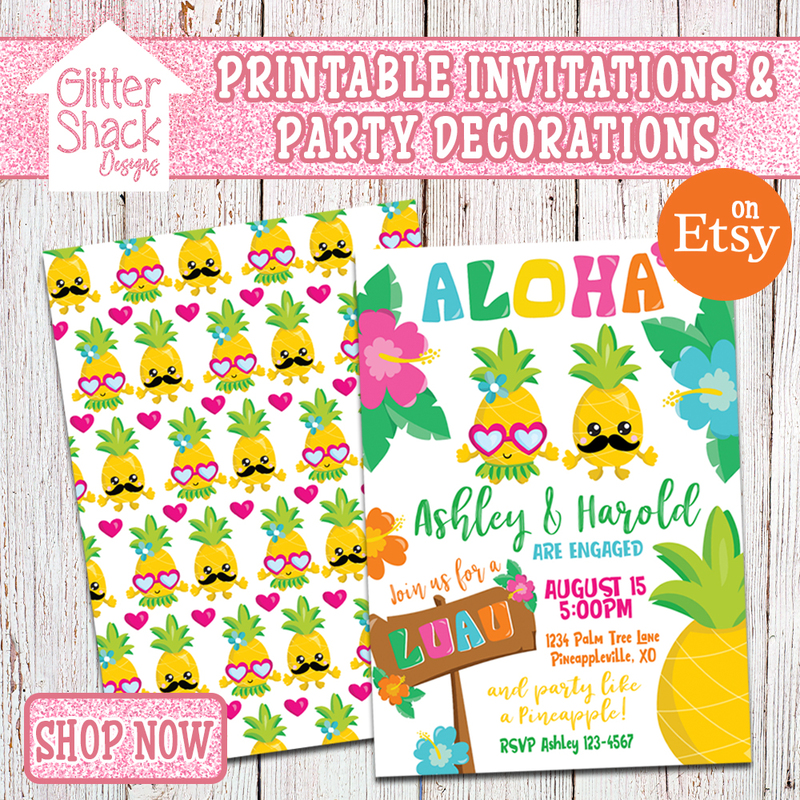 They can be wiped clean after the party and stored for the next time. 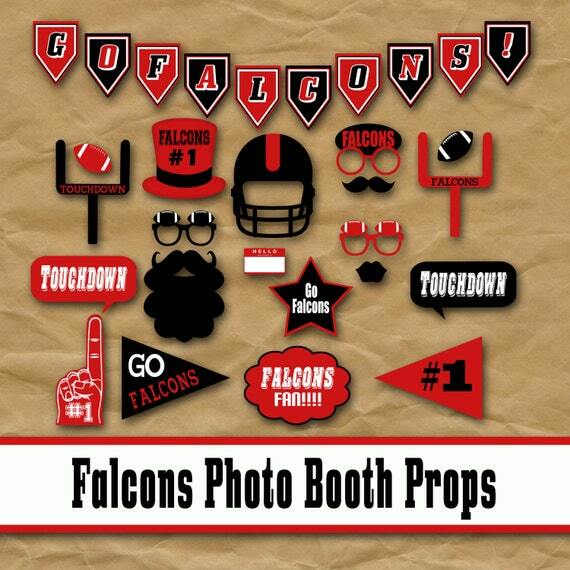 This set of 17 fun football photo booth props includes 2 helmets, black eye glasses, a beard, 2 mustaches, 2 lips, 1 football, 1 whistle, 1 trophy, 1 foam finger, 1 hot dog, 1 soda pop, 1 beer, 1 clipboard and 1 touchdown sign. 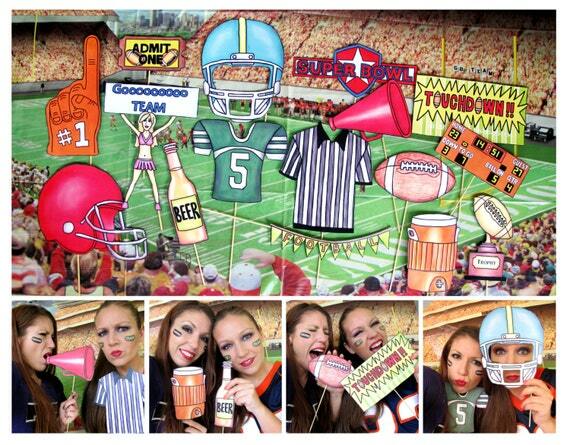 This set is great for cheering on your favorite NFL, high school or college football teams all season long. 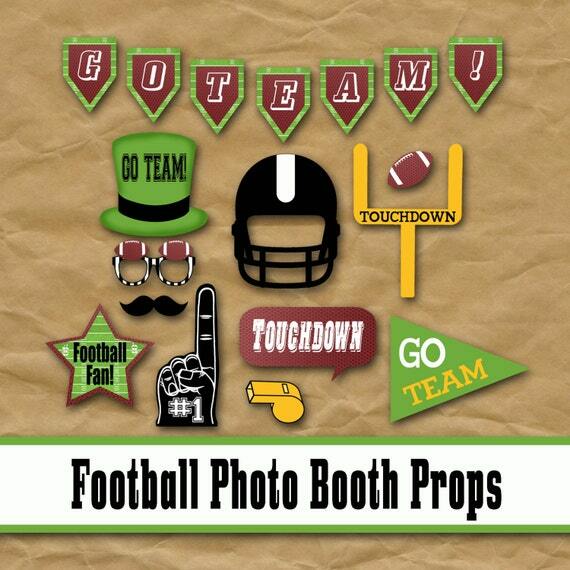 Here is a fun collection of football photo booth props for adding some goofy fun to your football watching get-togethers. 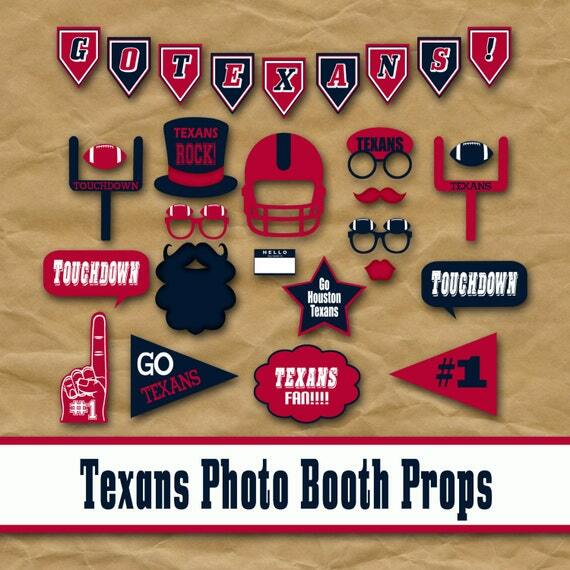 This set includes 16 props including a green football jersey, blue football helmet, red football helmet, referee shirt, Super Bowl sign, football garland banner, beer bottle, football, trophy, admission ticket , goooooo team sign with cheerleader , touchdown sign, megaphone, foam hand fan accessory, football scoreboard and orange water jug. 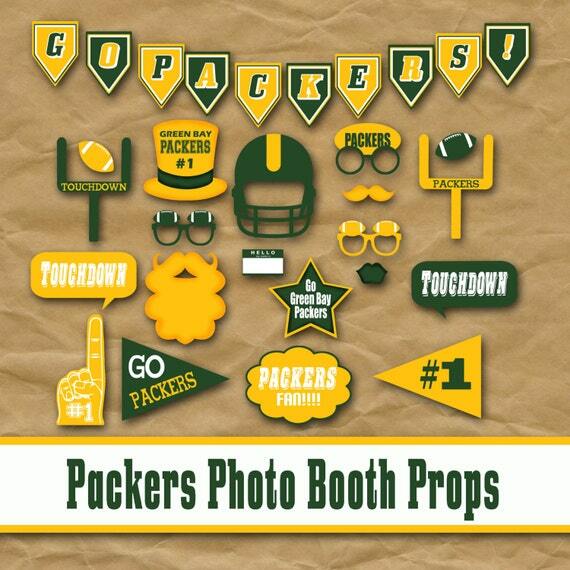 Choose your favorite NFL team from this huge selection of football team photo booth props. 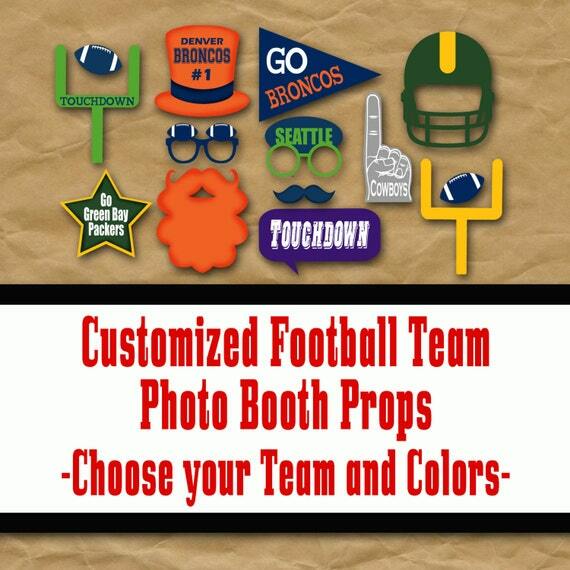 You can customize the props by choosing your team and colors which is perfect for supporting your local high school and college football teams. 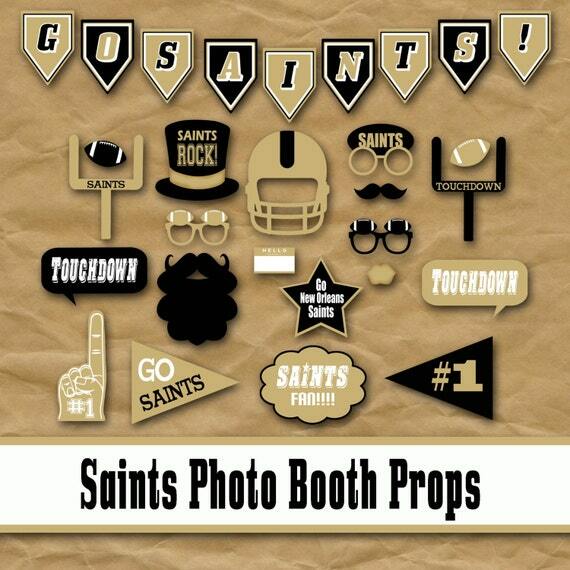 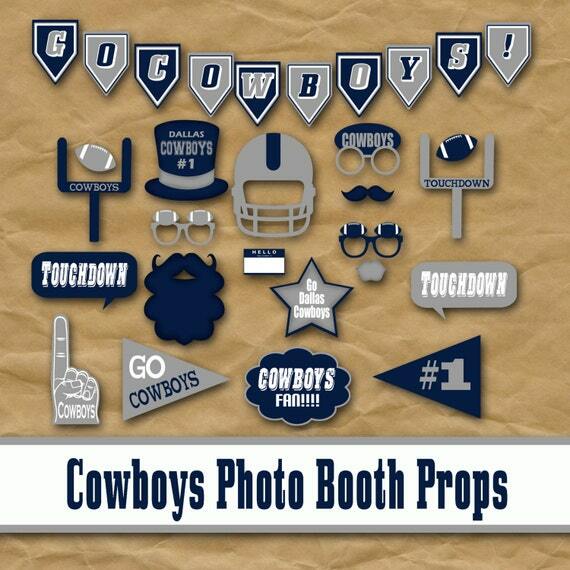 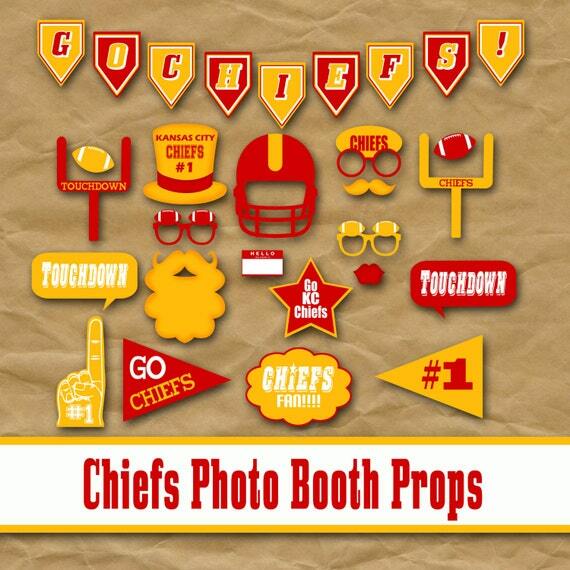 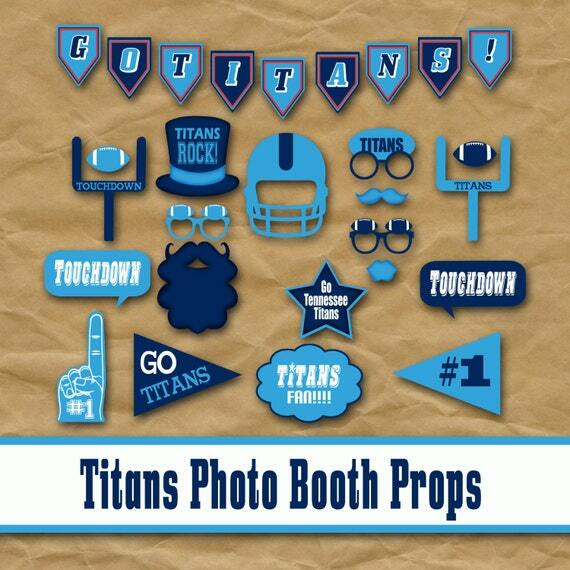 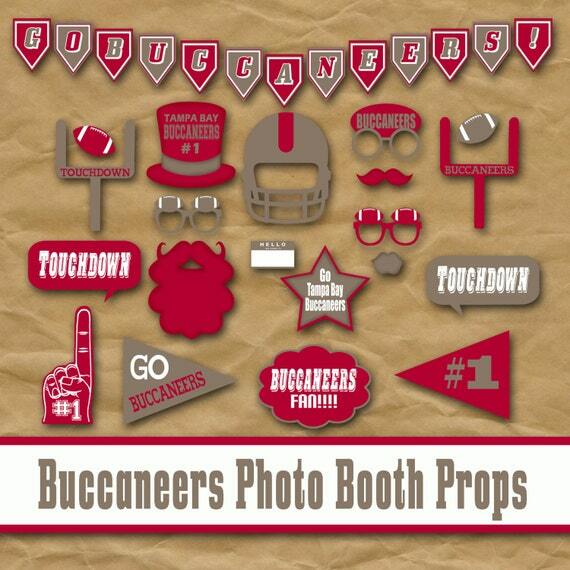 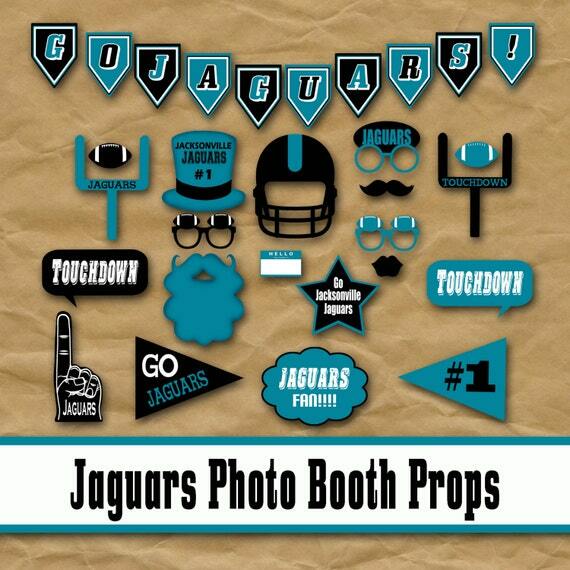 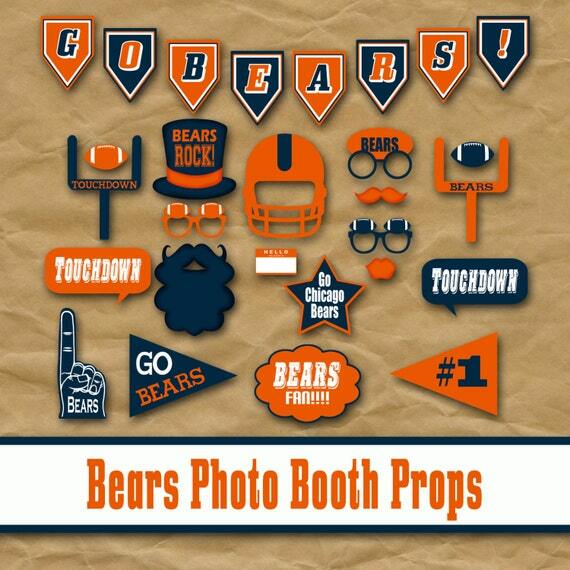 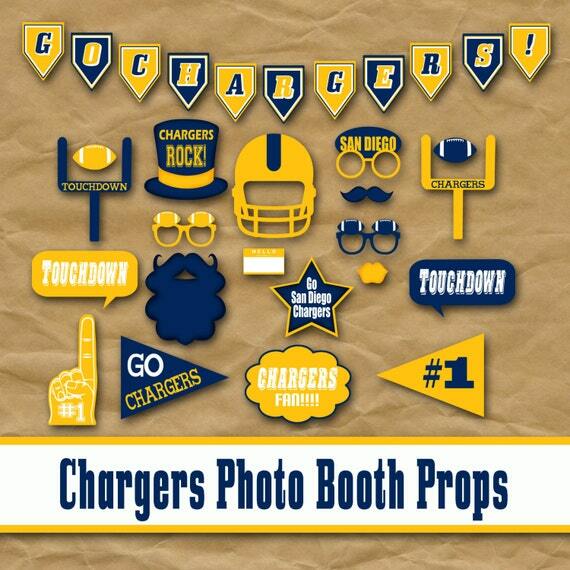 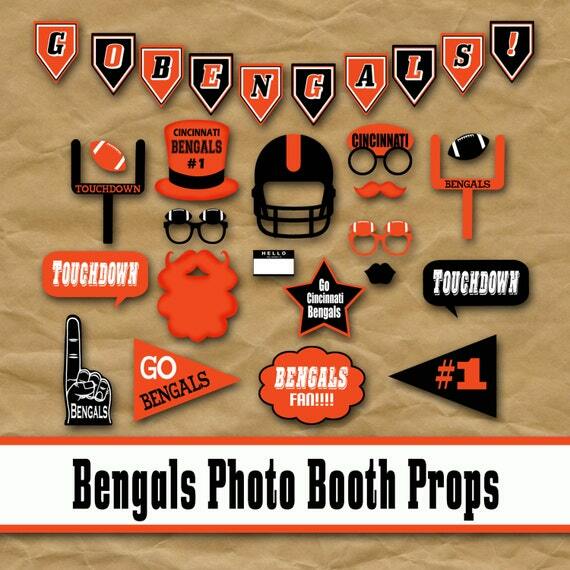 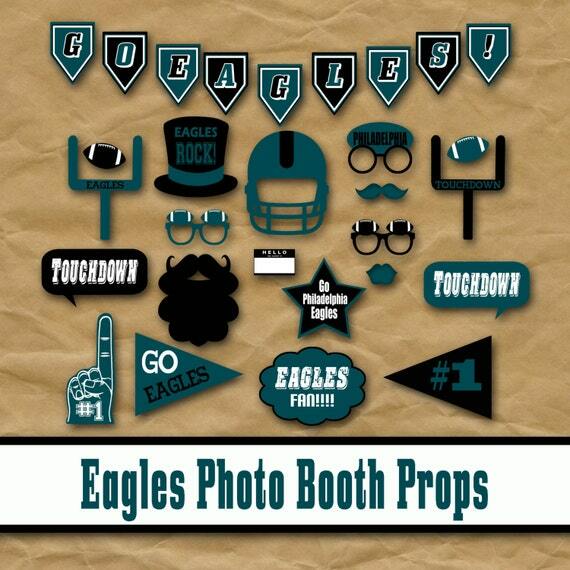 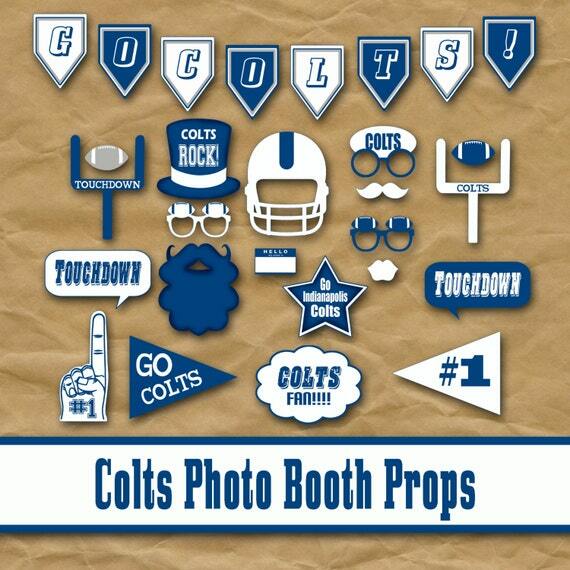 Each set includes 35 photo booth props including mustaches, lips, beards, football helmets, glasses, top hats, goal posts, small footballs, large football, foam fingers, triangle pennants, touchdown signs, word signs, name tags, banner, photo booth sign and cupcake toppers. 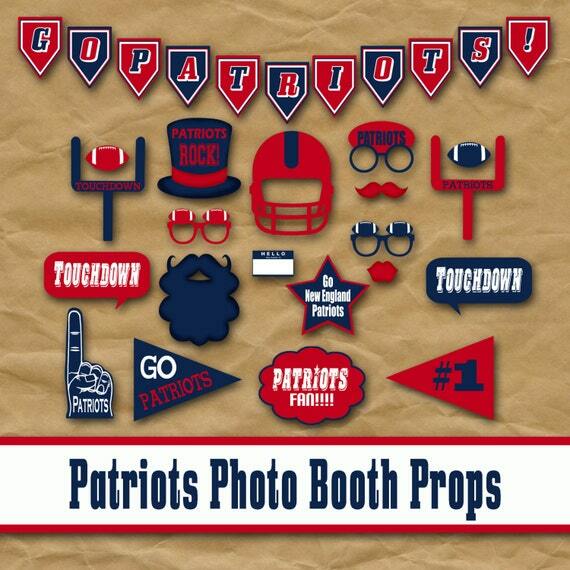 This article will be updated in January 2107 with photo booth props designed for the 2 teams playing in the 2017 Super Bowl championships. 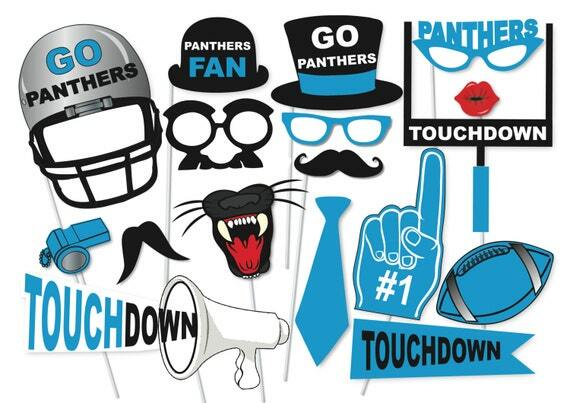 Choose from two sets of photo booth printables, the Carolina Panthers or the Denver Broncos, for cheering on your favorite team during the Super Bowl this year. 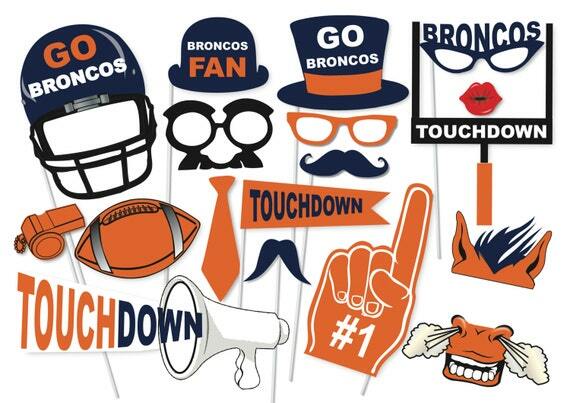 Each 20-piece set includes a combination of helmet, hats, glasses, mustache, tie, whistle, foam hand, football and touchdown signs props. 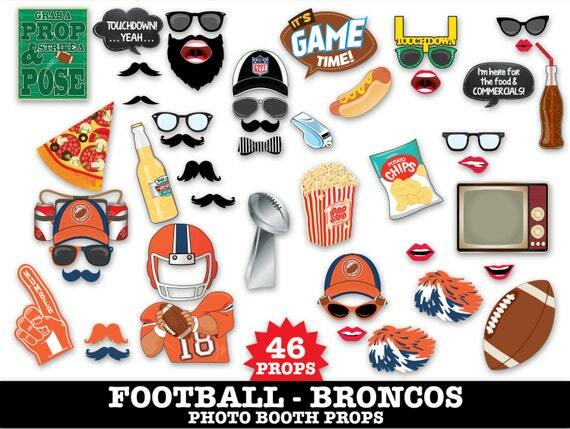 Here are three more fun sets of printable Super Bowl 50 photo booth props. 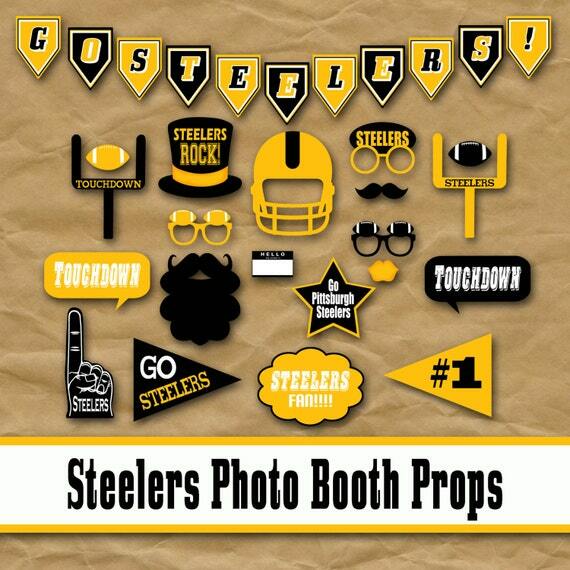 Choose a set with the team you are cheering for or pick up the combo set that includes both opposing teams. 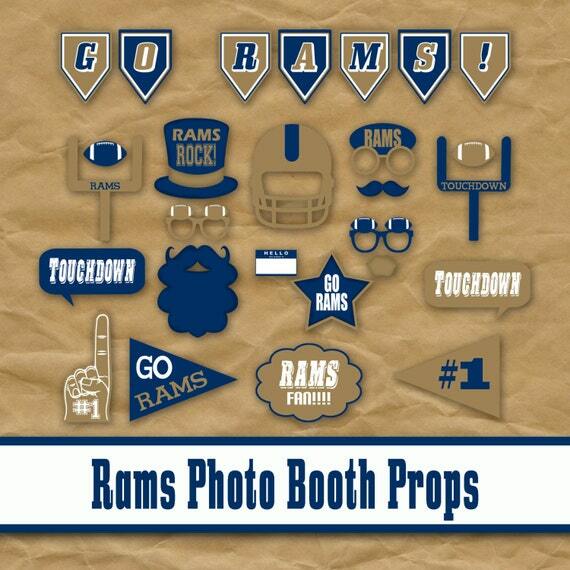 The individual team sets each include 46 props and the combo set includes 58 props with both team colors. 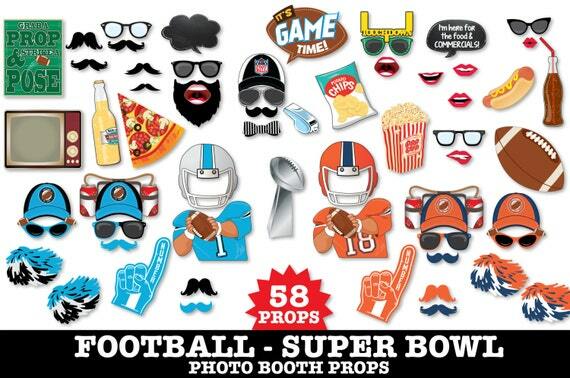 All these sets include 34 football-themed props that are non-team specific that can be re-used all year long at all your football watching parties. 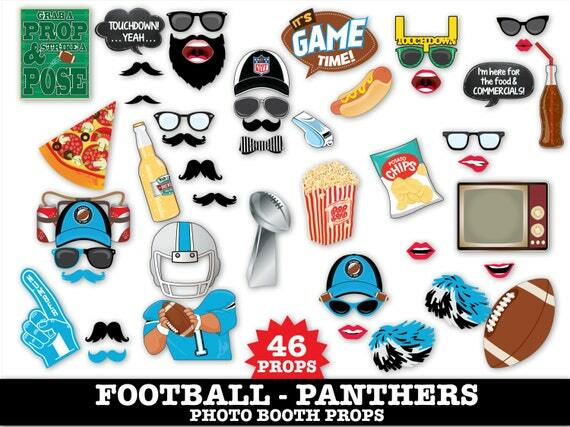 This package of Super Bowl 50 photo booth props includes 29 props for cheering on the Carolina Panthers and Denver Broncos. 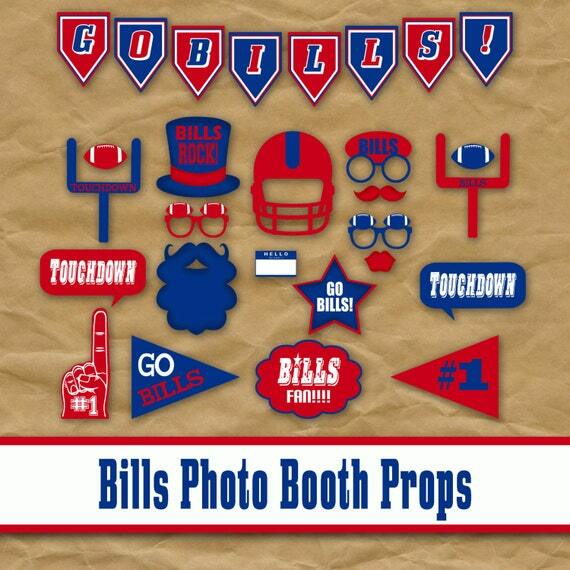 You will get a selection of helmets, eyeglasses, foam fingers, pom poms, mustaches, lips, whistle, bowtie, clipboard with plays, Super Bowl trophy, football, goal post, beer mugs, hot dog, hamburger and a touchdown speech bubble. 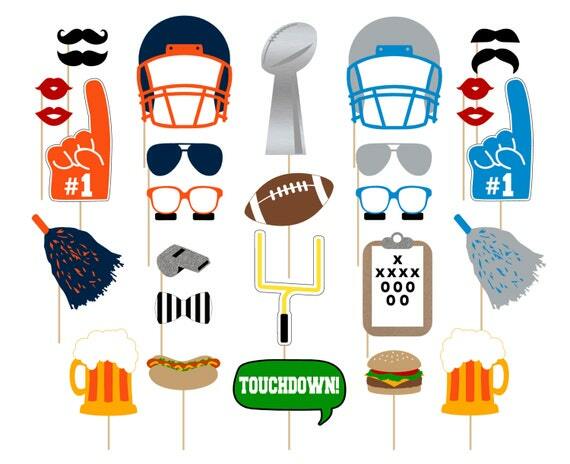 Kick Off Your Super Bowl Party With One Of These Super Bowl 50 Party Invitations! 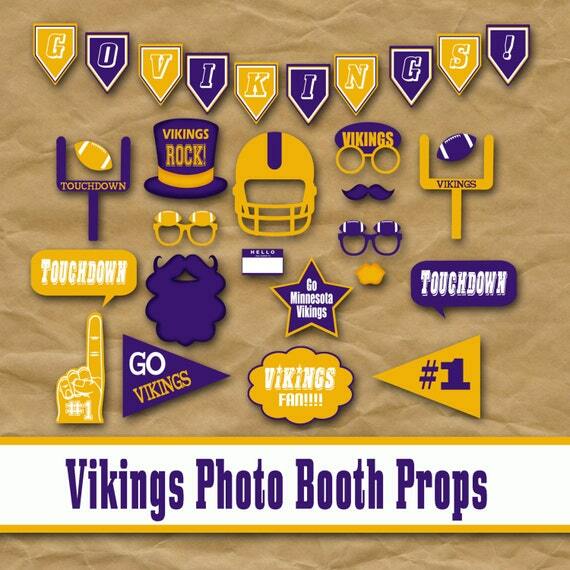 Print them at home, at a one-hour photo center or send as an e-vite. 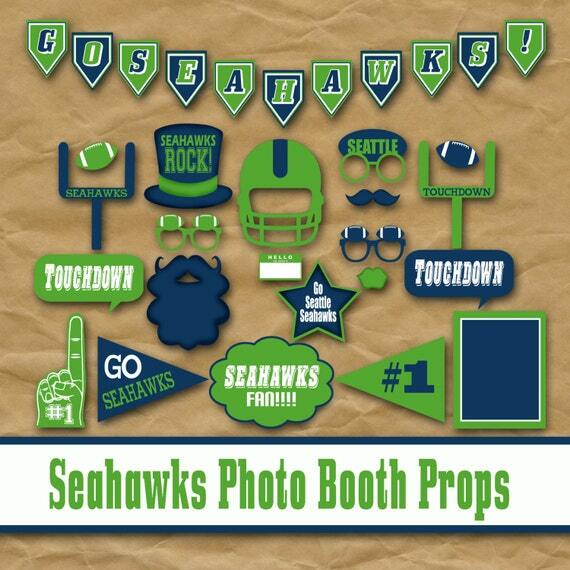 I hope this collection of printable football photo booth props helpful and you found a set for cheering your favorite team on!